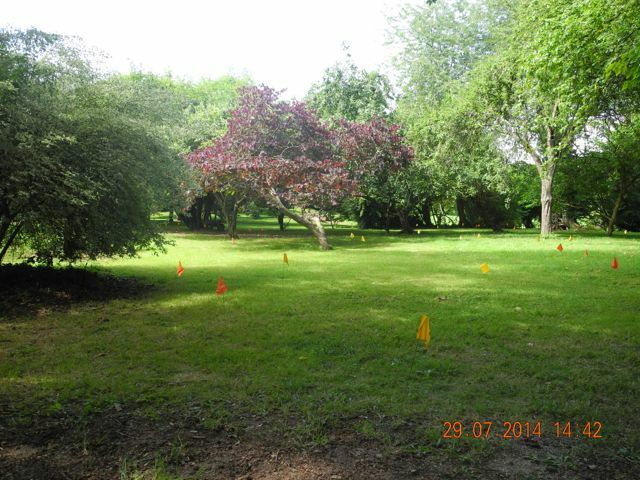 July 2014 - Preparations Go On Apace. 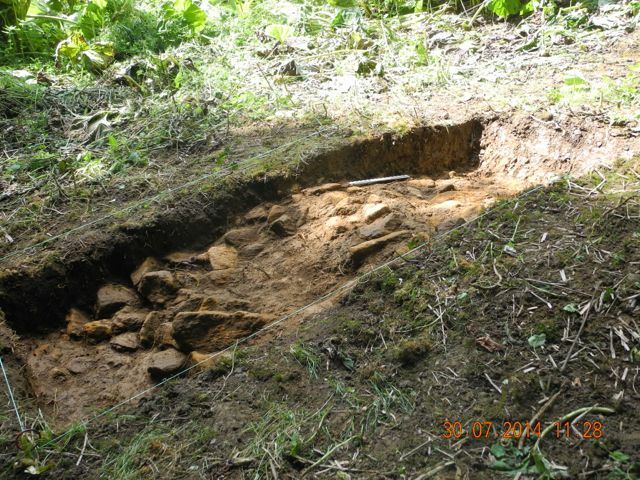 As summer wore on and peak digging season approached we opened up a further new area at Enstone. 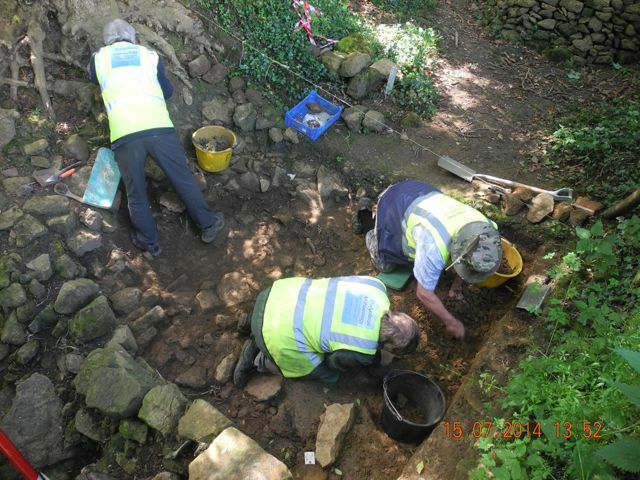 The trench with intersecting walls at the end of the 'alleyway' was now up for detailed recording so lots of form filling and stone drawing there. 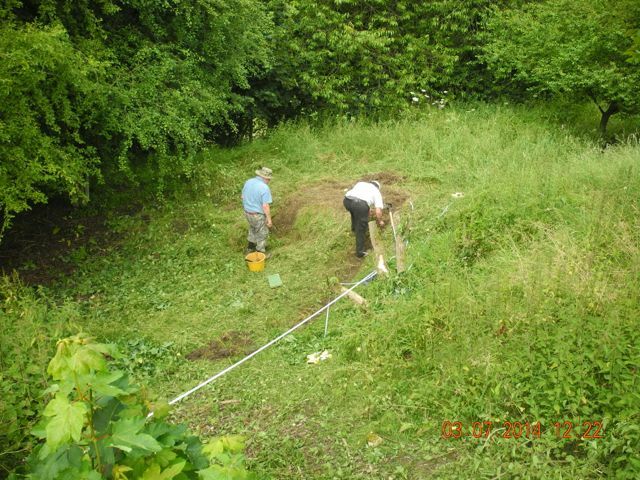 To keep our eager volunteers busy and to further contribute to our understanding of the complicated little collection of earthworks on the north west corner of the formal gardens we began investigating a large sunken feature. 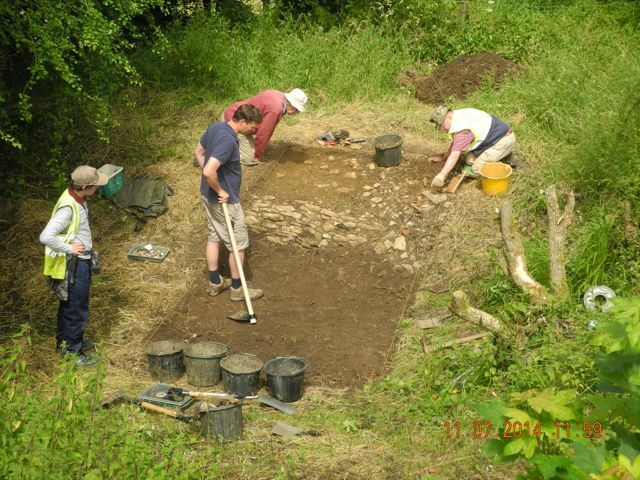 Dried up pool or fallen in cellar were our two main theories to account for this and shortly after starting to strip way the turf it became clear that we were looking at rather a nice stone revetment for a small pond, presumably of the ornamental variety. 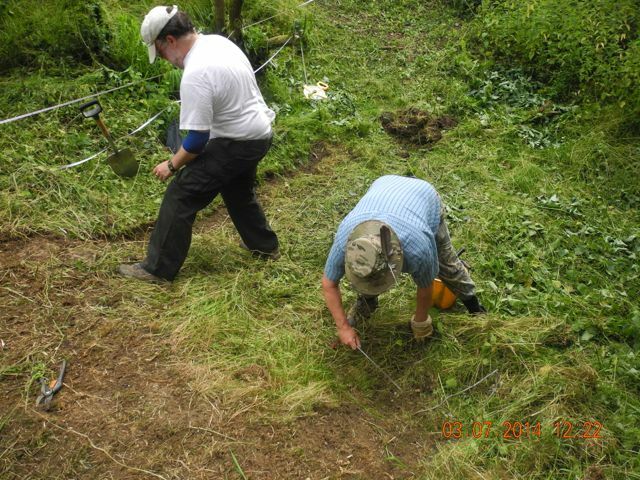 The two Peters start turf stripping in our sunken feature and one of them uses his machete to shear the grass short... I wonder if it works with sheep. 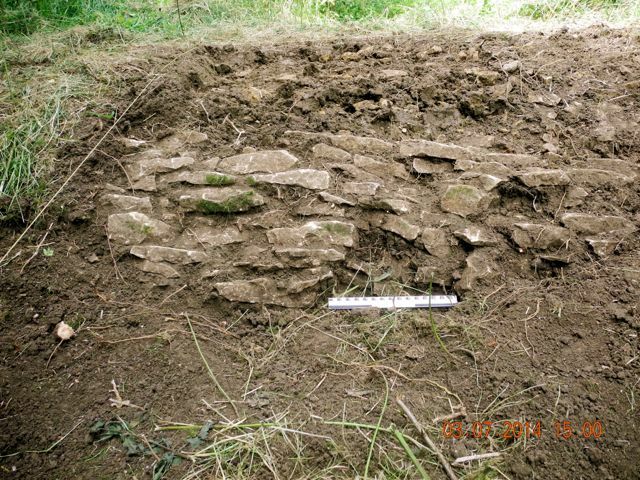 Some very interesting material appearing in the fill of our feature which is transformed into a pool by the discovery of a stone revetment. 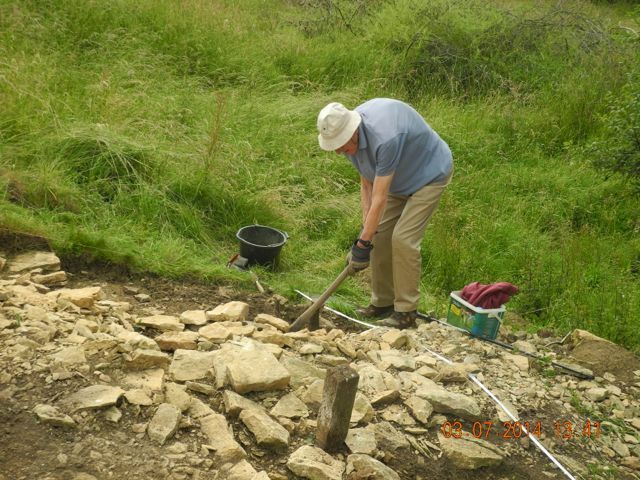 Meanwhile Robin valiantly wields a pick to take out the last of the topsoil from ENA14 Area C as we like to call it and the detailed process or recording every stone begins. The following week we were delighted to welcome Nick back to the digging fold as he gave sterling service in further clearing topsoil from the pool area. 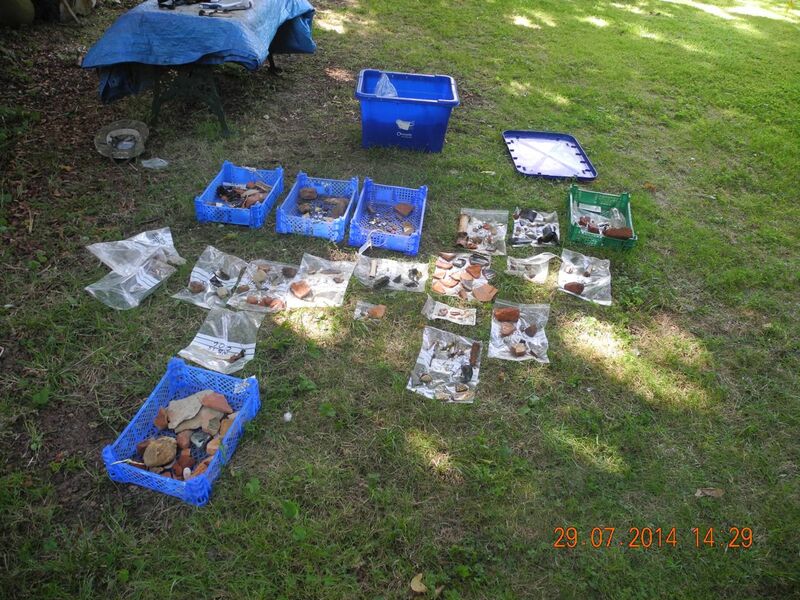 Hard work but masses of finds albeit mainly nineteenth and twentieth century pottery and glass. 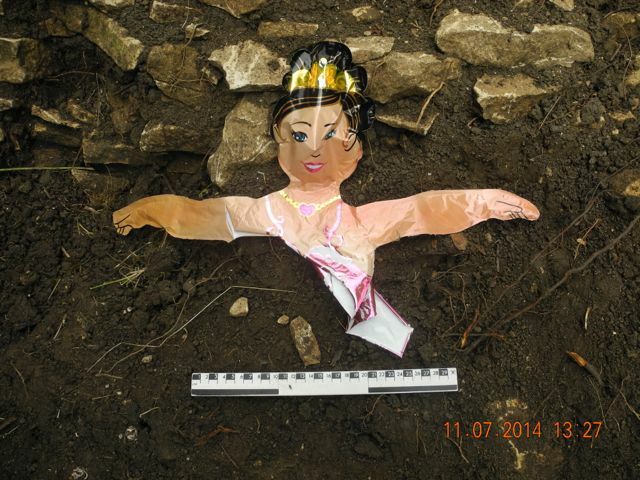 Samuel bravely volunteered to begin a detector survey of the adjacent fields and whilst that was underway we made the most amazing discovery, clearly an ancient pagan fertility goddess, this is going to revolutionise our understanding of iron age balloon technology! Robin and Andrew finish the job... almost. 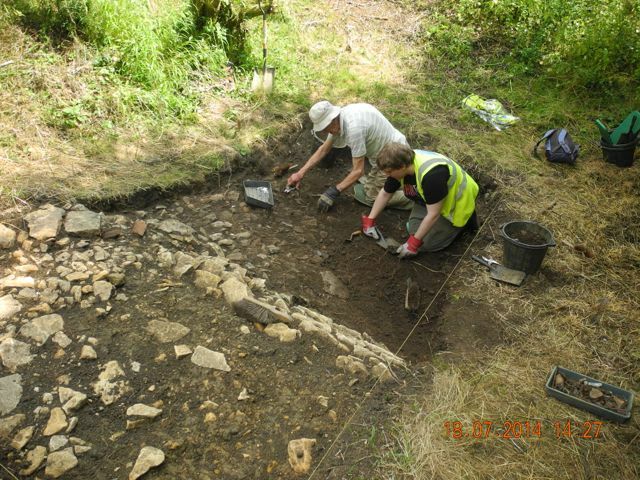 By the following week we had pretty well finished stripping the turf and topsoil to reveal the extent of a mass of tumbled rubble pottery and glass which had clearly been trundled down and tipped into the pool presumably sometime in the later nineteenth or early twentieth century judging by the finds. We weren't neglecting Hanwell. More work was done up stream of the feature we desperately want to turn into a sluice of some kind but clearly we still have a lot of rubble to clear, record then shift. Down stream the recording was completed - there were a lot of stones to draw to leave us well poised for a major effort in August. Up stream rubble, the Second Sluice area view looking north west and a week later looking north-east. 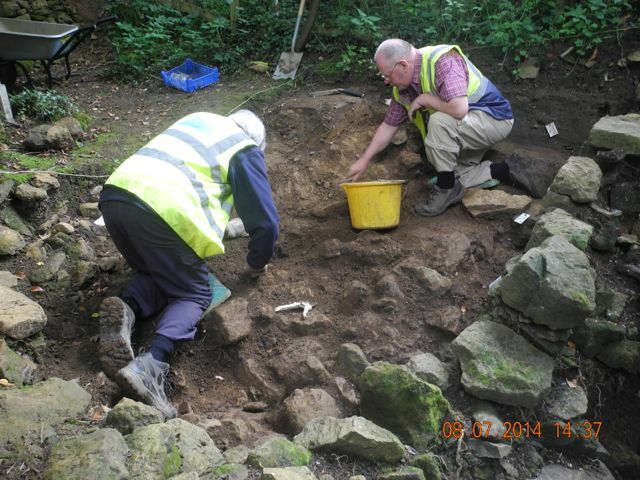 Pat and Albert have kindly taken on the role of finds washers extraordinaire and have done a couple of sessions for us recruiting an extra washer for their second session. Below are the fruits of their labours. It will be very useful to have them on board, especially once the finds start flowing from the big dig in August. We were also having discussions as to the best place to set up the marquee or possibly marquees for finds washing, tea tent and occasional common room/social club. 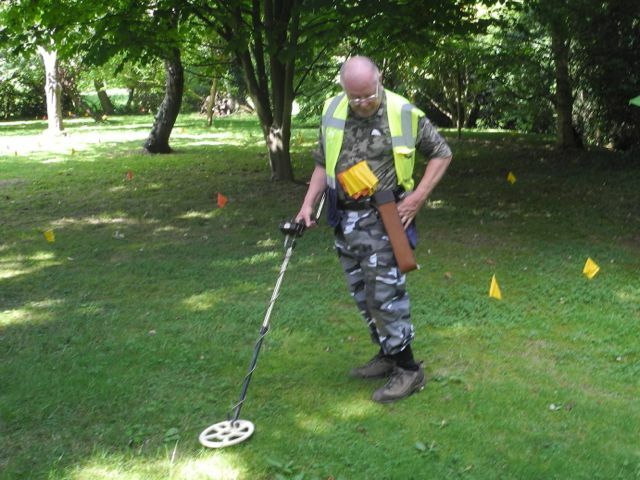 As we were examining the lawn we thought it might be interesting to carry out a preliminary metal detector survey just to check the distribution of metal objects and determine if there were any unusual clusters - there weren't . Spread out to dry, in the process of cleaning we discovered another piece of decorated medieval tile and a decorated bowl rim that we hadn't spotted in their muddy condition in the finds trays. Peter photographed them for us then and there. 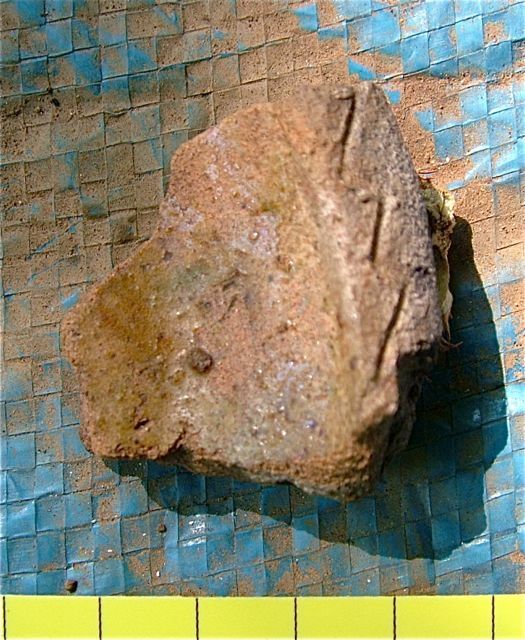 Peter's comment: With regard to the sherd of pottery (right) we thought as 12-13th. 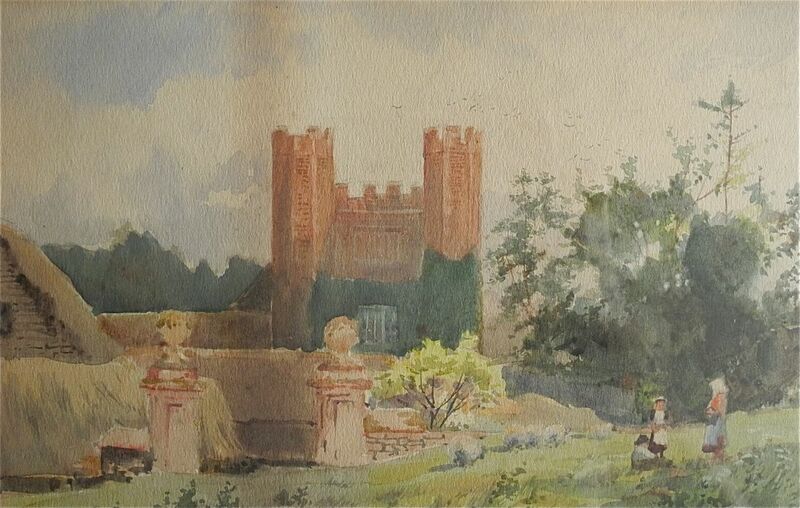 century; may I suggest that Brill/Boarstall could be the answer and probably leaning towards the later date, ref. fig. 54, 1 Mellor, M. 1994. 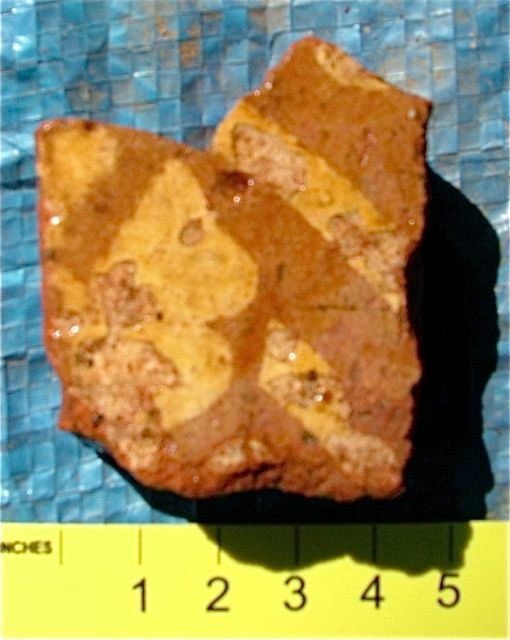 Oxfordshire Pottery: A Synthesis of middle and late Saxon, medieval and early post-medieval pottery in the Oxford Region. This date would of course match that of the tile displaying a possible 'Gothic' design of that period (left). Peter is modeling the very latest in off the hip quiver wear, a natty product to keep marker flags for the detectorist around town.. or field. Ask Peter for details. And here are the flags spread about. 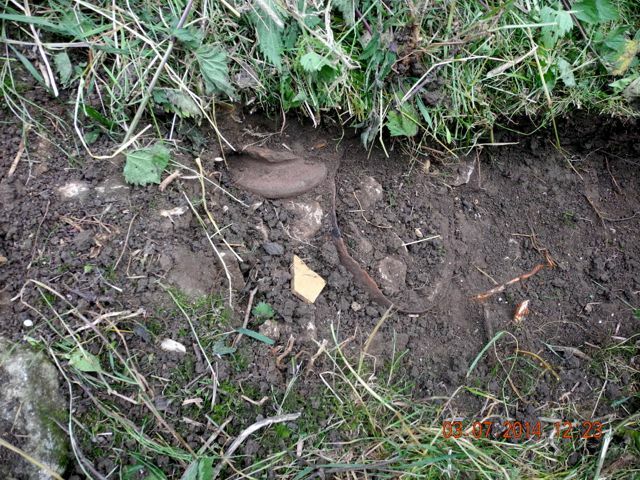 Conscious that we needed to prepare the ground for the influx of diggers in the following month we made determined efforts to carry on taming the undergrowth. Once again Peter stepped up to the plate this time wielding three feet of best Honduran steel to clear some pathways. 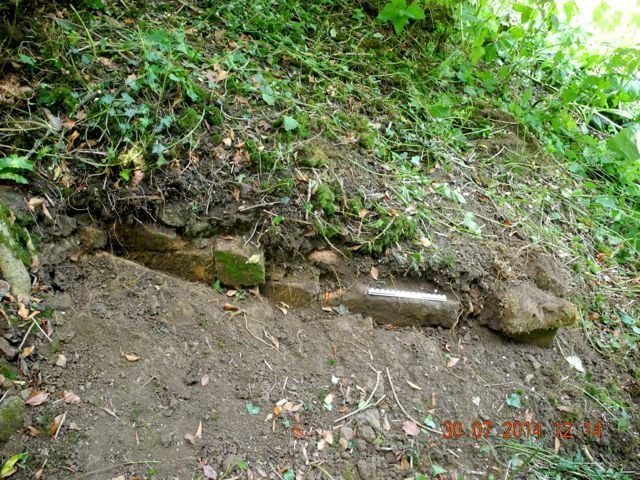 Following in his wake I continued the thankless task of spading out 'turf and topsoil' only to hit serious quantities of stone which once cleaned up turned out to have significant structural features. Exhausted by this discovery I decided to go up to the Temple of Flora and do something a little less taxing, some weeding perhaps. Anyway I'd just got started and the first clump of nettles I pulled up had spread its roots around a nice block of ashlar and then another and another. 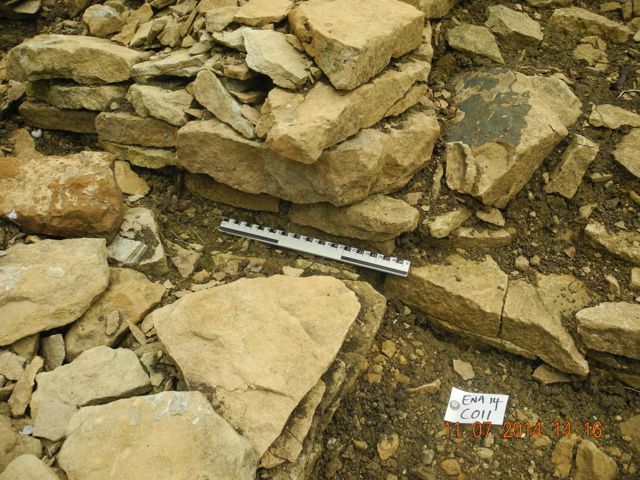 Archaeological weeding at its finest. It's a curious feature running down the slope at right angles to the pre-existing wall. My best guess at present is that it could be a flanking wall for a flight of steps leading down from one terrace to another. Work on this next month is going to be quite exciting. The foot of the East Terrace looking south-west. The new walling at the Temple of Flora looking north.